Above photo: from Fight for the Future. National #OneMoreVote Day of Action Results in Hundreds of Thousands of Phone Calls and Emails and More Than One Million Petitions Signed. Protests Were Held Across the Country. 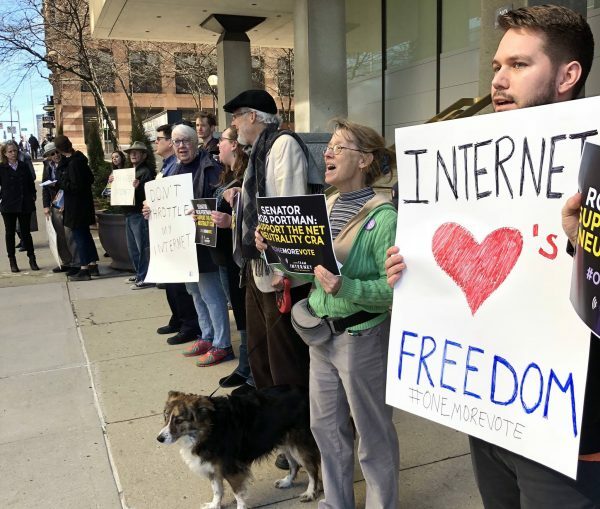 Tuesday was a national day of action urging Congress to pass a resolution under the Congressional Review Act (CRA) rejecting the FCC’s new rule that ended net neutrality. 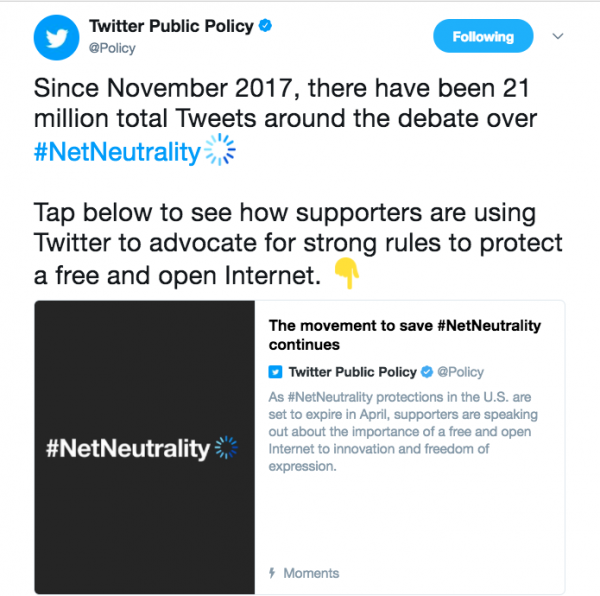 Numerous advocacy groups (including Popular Resistance and our Protect Our Internet campaign), individuals, corporations and websites participated. Reddit, Slashdot, Change.org, Sonic, Sonos and Etsy and were among about 1,500 websites who participated. During the #OneMoreVote day of action, Resolutions of Disapproval under the CRA were introduced in both the Senate and House to overrule Ajit Pai’s FCC and save net neutrality. The resolutions would block the FCC’s repeal and restore basic protections that prevent giant cable companies from abusing their monopoly status to control what we see and do online. In the Senate, Ed Markey (D-MA) is leading the effort for a Resolution of Disapproval. It is supported by every Senate Democrat, both independents and one Republican, creating a 50-50 vote that would be broken by the vice president. We are one vote away from passing the resolution in the Senate. As a result, the Internet coalition organized the #OneMoreVote national day of action. People used the Battle for the Net’s #OneMoreVote campaign to encourage their Senators to support the CRA. (You can still do so.) A total of 1,996,219 people signed petitions to Congress, more than 230,202 called their member of Congress, and 713,133 emailed them. Online protests have been massive ever since the FCC announced the repeal of net neutrality last December. Twitter Public Policy center points out how active Twitter has been. In the House, Representative Mike Doyle (PA-14) has 150 co-sponsors on his CRA bill. A majority of House members are needed to move forward. Continue to flood the Senate with calls and emails until we get that 51st Senate vote and more. Every senator should represent the national consensus that favors net neutrality and treatment of the Internet as a common carrier. Dozens of pro-net neutrality companies will be in touch with the most likely Senate offices. 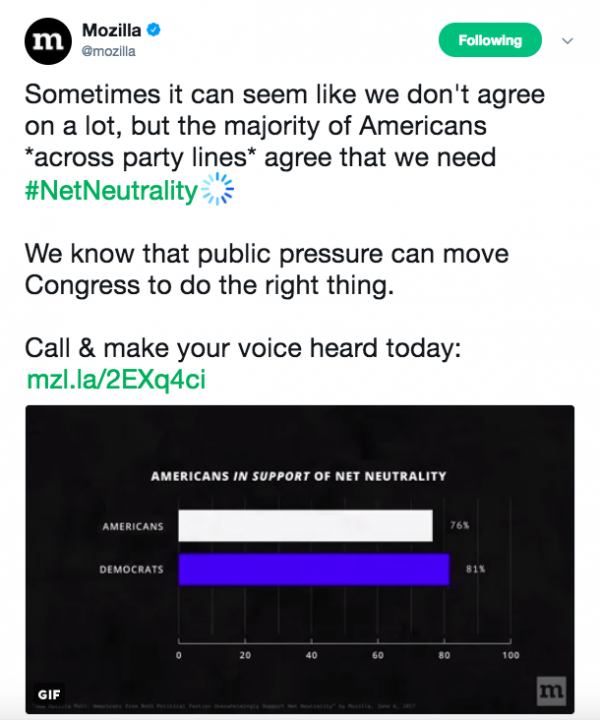 These small business delegations will emphasize that net neutrality is critical for commerce. Hold more in-district events that generate local press coverage in key lawmakers’ own backyards. Senators will see their constitutents care about this issue and will hold them accountable. Mobile tech and advocacy websites and Internet users are mobilizing for a massive push to win in the Senate, and are preparing to take the fight to the House. 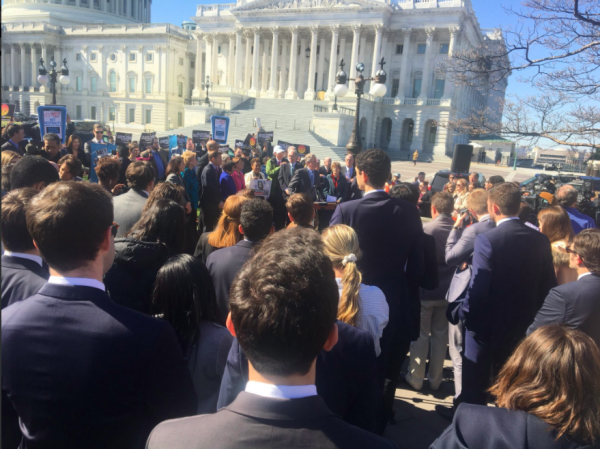 People gathered outside the Senate as supportive members of Congress and representatives of grassroots groups spoke. Senator Ed Markey announced that he is officially introducing the Congressional Review Act (CRA) resolution to block the FCC repeal of #NetNeutrality. 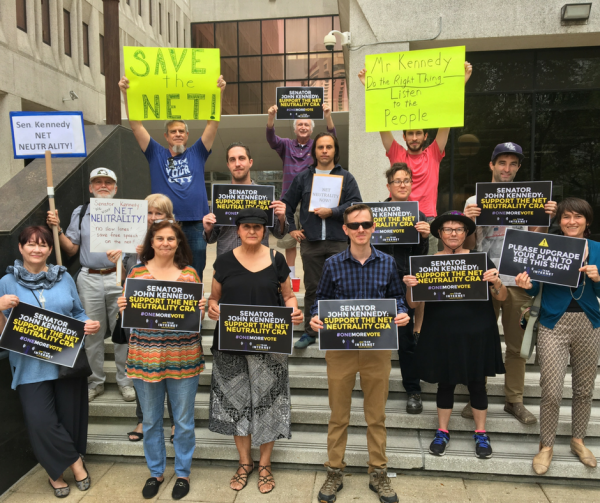 People supporting #NetNeutrality CRA outside Senator Kennedy (R-LA)’s office in New Orleans. 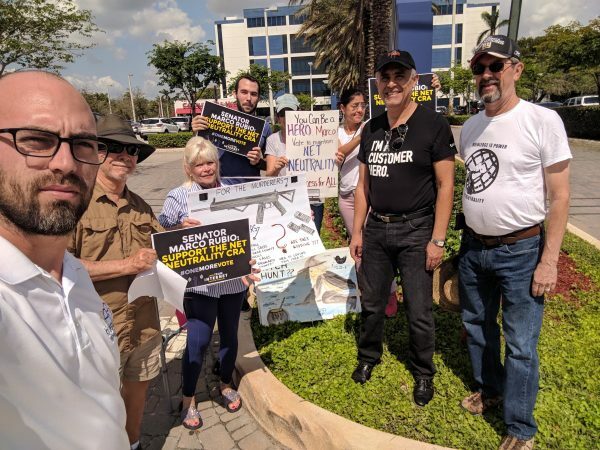 Miami residents gathered outside Senator Rubio’s office calling on him to support the CRA to restore #NetNeutrality. 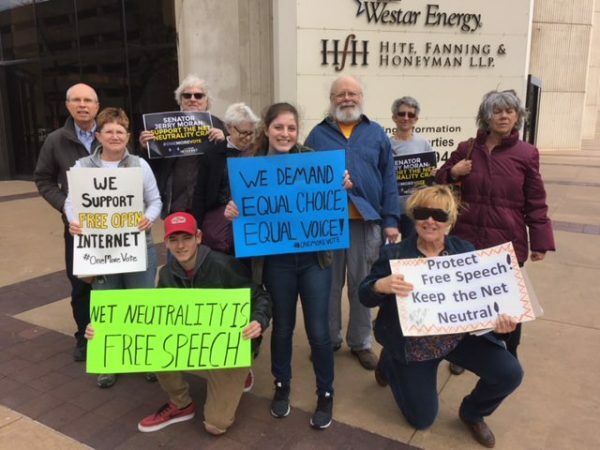 #NetNeutrality activists gathered outside Senator Moran’s office in Wichita, KS to urge him to save the Internet. 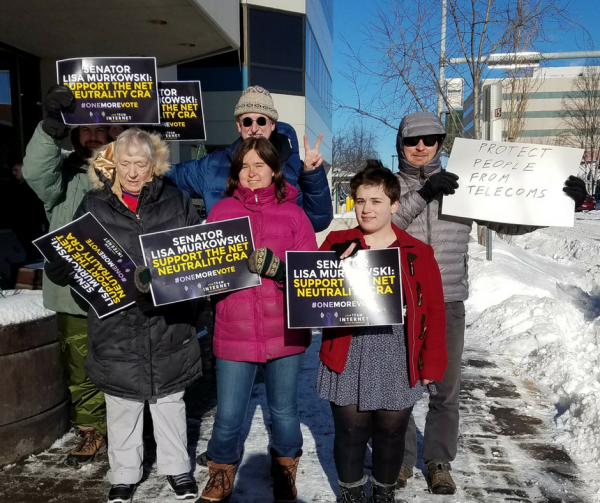 Alaska residents outside Senator Murkowski’s office in Anchorage urge her to support CRA.